While we are waiting for my house to sell and the money to start happening, the one task I can perform is demolition. Demolition doesn't cost anything, and if you're careful, you can do it all on your own. 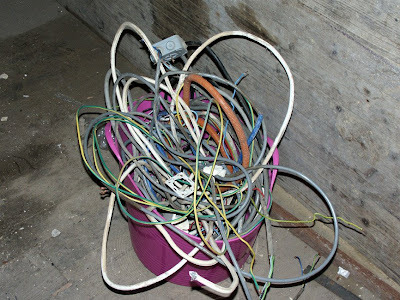 This week I have started removing all the old electrical wiring from the house. The photo below is just of the wires I removed from our entry hall - 5 metres x 3 metres. I don't know if the person who installed the wiring was a lunatic or a genius, but he managed to cram over 50 metres of cable and 7 junction boxes in to one small space. A similar amount of wire has come out of the kitchen (although there is one wire that appears to lead nowhere and has just been cemented in to the wall). Over the next couple of days I will be pulling the wiring out of the barn and the upstairs rooms. I have no doubt this will cause a mess. I am good at messes. Les Papillons de jour de France, Belgique et Luxembourg et leur chenilles, Tristan Lafranchis, one of the outstanding Parthenope Collection of field guides for FBL, published by Biotope, 2000. Distribution maps (indicating status by départment);good photographs of adults in the field, illustrations of caterpillars not so successful, mais c'est déjà ça; good notes on plant associations, habitat and flight periods. Field Guide to the Dragonflies of Britain and Europe, by the Dutch expert KD Dijkstra and illustrated by the incomparable Richard Lewington, British Wildlife Publishing, 2006. Lewington's beautiful illustrations allow all diagnostic features to be clearly indicated. Distribution maps (small, as they show the whole of Europe, but borders and major rivers marked); notes on habitat and flight periods. Limited to adult dragonflies and damselflies, so if you are into pond dipping and have netted a fearsome nymph or want to identify an exuvia, this book cannot help you. Also available in French. Guide des Mouches et des moustiques, J & H Haupt, Delachaux et Neistlé. Originally in German, this provides a good overview of the diptera (true flies) of Europe, with an interesting (not dichotomous) key to families in the front. The photographs are often not very good, and a beginner would be very unlikely to get an accurate identification from the necessarily small selection of species featured, but for a more experienced amateur, it provides a useful aide memoire. Diptera are so numerous and so diverse, that no one is an expert in all families, so it can be helpful to have this little book to remind you what the possibilities are. The descriptions and ecological information is brief but useful. Insects of Britain and Western Europe, Michael Chinery, Domino Field Guide, revised 2007 edition. A general guide that will give you an idea, but quite often not an accurate identification. The choices of species included are sometimes curious, in that they are not always the most likely to be encountered. However, it does provide an excellent overview of the possibilities (even if there are too many moths and not enough flies). 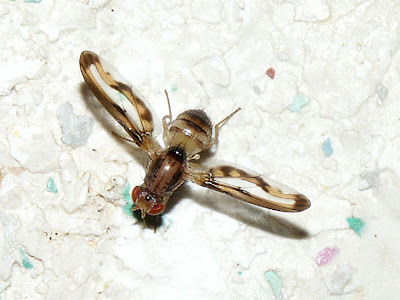 It has a 'twin', Insects of Britain and Northern Europe, by the same author, and they are frequently confused. IoBNE is favoured by many professionals as the better book because it has keys, but it is let down by its inferior illustrations and by the fact that it contains fewer species that are relevant to France and Britain. I have packed IoBWE for its general usefulness, and because it is quite good on bumblebees, a group for which I don't have any literature that covers France (although I have several excellent guides for Britain). Hymenoptera (bees, wasps and ants) in general are not well served by field guides. Field Guide to the Mammals of Britain and Europe, F H van den Brink, Collins, 1967. We picked this up for £1 when our local library had a chuck out session. An oldie but a goodie. Distribution maps, good colour illustrations of each animal, lots of black and white drawings of tracks and signs. Of course, some of the scientific names are out of date now. The European Families of the Diptera: identification, diagnosis, biology; Pjotr Oosterbroek, KNNV Publishing. Originally in Dutch. Not strictly necessary to travel with, but jolly handy if I get anything I can't immediately slot into a family. Beautiful line drawings. 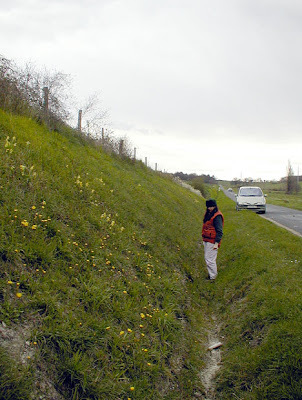 Here I am at this time last year, studying the wealth of flora on a roadside bank near Preuilly. Since I'm standing in a ditch, I can inspect the plants eyeball to eyeball, as it were. Simon is probably very grateful that I had this opportunity to engage in my favourite pastime without embarrassing him too much. According to him, most people's first sight of me is with my backside in the air, bent over to peer at something very close to the ground. 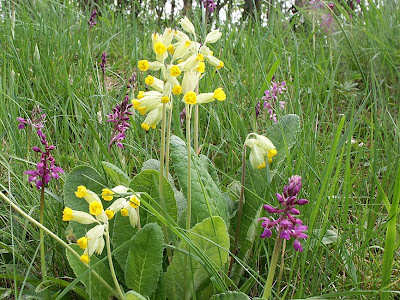 The Cowslips you can see in the picture featured in our blog post from last year here. They will be succeeded by orchids. The soil in this bank is typical of the soil around Preuilly - a sort of chalky loess. Both the primrose family and the orchid family self seed very easily, and roadside banks are prime sites for looking at them - so long as you can park up safely, not always easy or even possible. This road, although narrow and bounded by deep ditches, is fairly quiet. All the same, the French person who has just passed us is probably muttering under their breath about the stupidity of some people. Twelve months ago, this is what producing a meal in the house looked like. 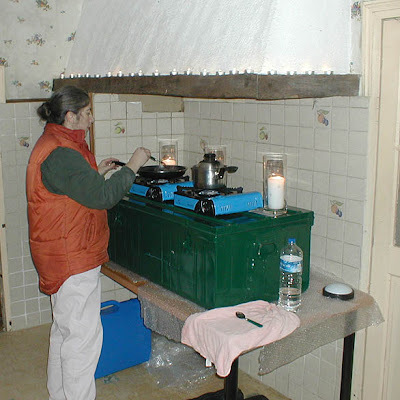 Now, we still cook on the little gas camping stoves, but we don't need to use the candles to see by. A week down, and although I have made no progress in restoring the house, I have had some wins in making it slighty more livable. Orchids (I assume early purple) and cowslips on the road to Chaumussay. It's nice again today, but as it's Saturday I am off to the dechetterie. Today is ANZAC Day: the day on which Australians and New Zealanders remember their war dead. The name comes from the initials of the Australian and New Zealand Army Corps, who landed at Gallipoli (Turkey) as part of an ill fated allied expedition intended to capture the Gallipoli Peninsula in 1915. After the Gallipoli campaign was abandoned, most of the Australian troops were sent to the Western Front. This is the main Australian First World War War Memorial at Villers-Bretonneux, about 20km east of Amiens on the road between Villers-Bretonneux and Corbie. 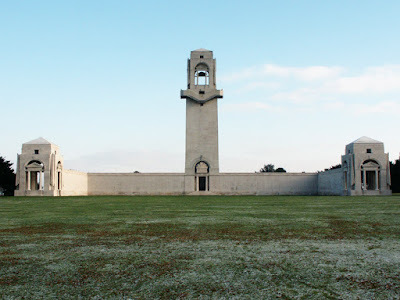 The memorial was designed by Sir Edwin Lutyens. On the walls of the memorial are inscribed the names of the 10,770 Australians who died on the Western Front; the battlefields of the Somme, Arras, the German advance of 1918 and the Advance to Victory. The War Memorial stands inside the Villers-Bretonneux Military Cemetery which is the burial place of 2,141 Commonwealth servicemen, including 608 "Known unto God" (unidentified) dead. 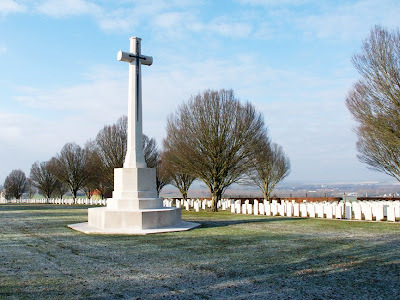 The cemetery is administed and beautifully maintained by the Commonwealth War Graves Commission, a British charity. 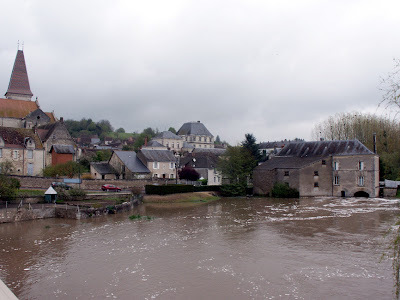 For those of you who read other blogs from France or live here, it will not be much of a surprise to hear that it has rained a bit since I have been here. In fact (and my parents won't believe this) compared to this, last June was almost a drought. Even the Claise is flowing. This is the river from our favorite spot - compare it to this. The drive down passed without incident, it rained a bit and I saw 2 single car accidents I am fairly safe in assuming were caused by driving too fast in the rain. Both were small cars on their roof just after a corner. The police, tow trucks and pompiers were in attendance at both, so I did my best to stay out the way and pass quickly. Apart from doing social stuff I have met the insurance lady, paid the plumber's bill and arranged for the phone to be put on. I have also installed a letterbox so that madame le poste can drop off all the advertising. I must pick up a "stop pub" sticker from the Mairie. Apart from cleaning, no work has yet been done on the house. That starts tomorrow. Maybe. 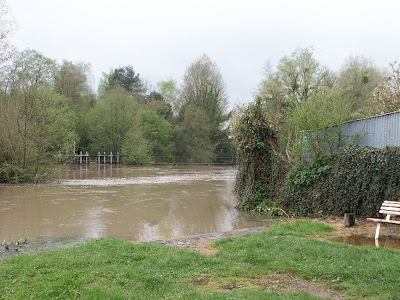 Another view of the Claise in flood(ish). When I am driving, I like to drive in silence. Maybe it is because after years of playing in orchestras and bands my ears have just got worn out, but I rarely actually sit and listen to music. I do have a few favorites that I am likely to have nearby after 12 hours on the road - just to add some interest. A compilation of New Orleans soul and funk. I have this on a mix CD with an assortment of other New Orleans funk - about 6 hours worth. Get those grooves! Just about everything they recorded all in one place. I like the early stuff best - I grew up in Australia in the 70's and this was the soundtrack to my youth. If things start to flag on the concentration front (usually just before I hit Tours), a quick blast of the first two albums revives like no other. A mix CD I put together of music by Django Reinhardt and Edith Piaf. Just to get me in the mood. Django is the perfect soundtrack as you drive through la France Profonde. I am much more likely to have some spoken work CD's playing - usually comedy. Favorite of the moment is Old Harry's Game - very sharp, and just a little cynical. 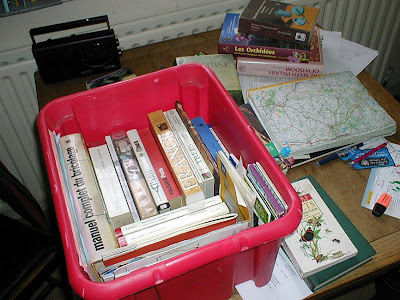 Here is a selection of botany field guides that I can't get by without, and so will be in the book box for France. The Wildflower Key, Francis Rose, updated by Clare O'Reilly, 2006, Frederick Warne. One of the reviews for this revised edition when it came out said something like 'you have more chance of arriving at a correct identification for a wild flower with this book than any other'. For a key based book it is extremely user-friendly and the illustrations are very good. Clare and her husband John have a Botany Blog, and Clare was one of my university tutors, so I know how much care and effort she would have put into the revision of this excellent book. Les Orchidées de France, Belgique et Luxembourg, 2nd edition, Société française d'Orchidophilie, R Duget & F Melki, Parthenope Collection by Biotope, 2005. The bible (and it's big enough). Extremely comprehensive and thorough; etymology of scientific names; all currently known naturally occurring hybrids listed (the field botanist's bane); distribution maps (to départment level); good photographs, which include a note on where taken. There is a charming little anecdote in the preface in which the editor relates meeting an English couple in the field, première édition in hand. 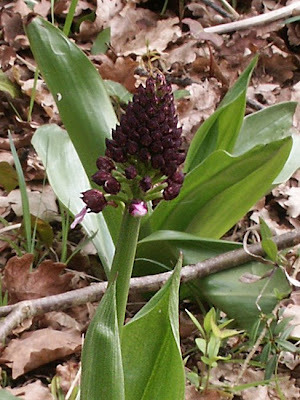 The introductory section includes a photograph of two members of the société laying on the ground, terrorising some poor little orchid with their macro lenses, with a wry caption to the effect of 'it's important not to get so excited you squash the plants', and a unexpected photo of orchids merrily flowering in the snow, once again surrounded by half a dozen oohing and aahing members of the société. Flore remarquarble du Parc naturel régional de la Brenne, François Pinet. Covers the rare and endemic species in the park only. An extremely good introductory section covering geology, climate and hydrology, which I have previously cribbed for the blog here, here and here. The information about each plant is good, right down to the number of places each species occurs in the park, and where. It has a major and extremely annoying fault though - the plants are listed in alphabetical order of French common name. This means that plants in the same family or even genus, which may be very similar to one another, are not always next to each other in the book, and if you are not familiar with their vernacular name, you may not even realise a plant's lookalike is even in the book. Photographic Field Guide: Trees of Britain and Europe, Bob Press and D Hosking, New Holland, 1993. One of those surprisingly good cheap field guides - pretty good photos, brief but professional descriptions, line drawings to clarify when there are lookalikes. Guide Nature de la Brenne, Jacques Trotignan, Tony Williams et al, 2nd edition, LPO & WWF-France, 2001. An excellent overview of the park and what can be seen there. The only criticism I have is that in order not to frighten people with long unpronounceable scientific names they have chosen to go with French vernacular names only, even in the checklists at the back. It makes it unnecessarily hard work cross referencing to other field guides. Les Orchidées du Bassin de la Claise Tourangelle, Christian Mouline, Les Cahiers de la Claise, 1995. A little gem of a book, with distribution maps pinpointing orchid plants in the Claise Valley down to a few metres. Umbellifers of the British Isles, BSBI Handbook No 2, TG Tutin, 1980. It may look old fashioned and have only line drawings, but it is the only way to accurately separate your Queen Anne's Lace from your Wild Carrot or your Cow Parsley from your Hemlock in the field. The only disadvantage in France is that you are dealing with more species than are present in the British Isles. The book teasingly tells you how many more species, but does not name or illustrate them. Colour Identification Guide to the Grasses, Sedges, Rushes and Ferns of the British Isles and North West Europe, Francis Rose, Viking, 1989. Easy to use guide for a difficult group of plants. Luckily, the boundary of the area it covers is the Loire Valley. Sedges of the British Isles, BSBI Handbook No 1, AC Jermy et al. The long awaited 3rd edition, 2007. Flowers of Europe: a field guide, Oleg Polunin, OUP, 1969. Another oldie but goodie, it is still the current text. I don't know if it is a symptom of the impending gallop to being 50 years old, the lifestyle change of owning a house in another country we can actually visit, or a just a sign that in the 21st Century we own too much STUFF, but I am amazed at what I pack to go to Preuilly. Not so long ago I was capable of travelling around the world for six weeks carrying just hand luggage. For six weeks in France I will be carrying; a computer and monitor, 2 cameras, 2 boxes of empty wine bottles (for refilling, naturally), 2 garden trugs, a guitar, a ukulele and a euphonium, a box of C.D.s and a box of books, 2 toolboxes, a stepladder, and a bookcase. And a HUGE suitcase full of clothing. And then................ I will be bringing most of it back to London. Makes sense, doesn't it. Celestine: Voices from a French Village by Gillian Tindall. 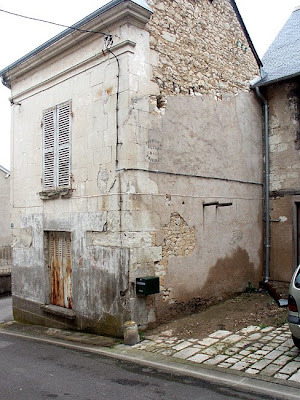 Gillian Tindall bought a house in Chassignolles, just south of La Chatre, and discovered some old letters there. This promted her to research the family (and in particular the Celestine of the title) and through them French village life through the ages. A lovely and informative book. 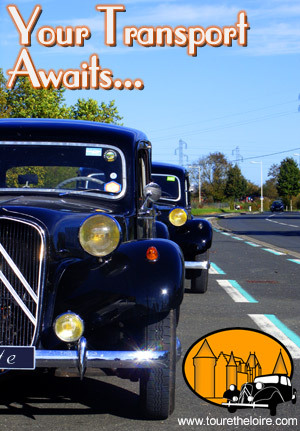 Almost French, A New Life in Paris by Sarah Turnbull. Sarah Turnbull grew up in the same town as me in Australia (Canberra), travelled to Europe on holiday and ended up staying, getting married to a Frenchman, and living in Paris. A useful sort of guide to living in France that covers things we really need to know - like why Parisian women don't wear tracksuit pants to go shopping (it is not nice for the baker). The Piano Shop on the Left Bank: The Hidden World of a Paris Atelier by T.E. Carhart. An American (and lasped pianist) discovers a piano workshop near to where he lives in Paris. A really nice gentle book about getting to know the French. The above books were really quite important to me when we were deciding where to move to - the French have a certain reputation, but these books showed that it needn't be all hassle and turmoil being a foreigner in France. Guidebooks: I will be carrying more of these than is usual, as Susan's parents will be with us and everybody has their own favorite. The Rough Guide to French Hotels and Restaurants. A translation into English of "le guide du routard", which I consider to be the best of the cheap but good bed and food guides you can get for France. Indispensable, thoroughly reliable. I have an old copy of Routard Paris in French that I still use. 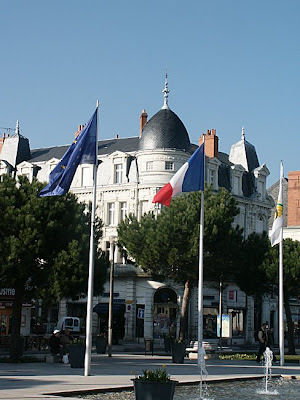 DK Eyewitness Travel Guide: France. Yes, there has been some "scandal" about the lonely Planet books, but that has mainly been about the restaurant and hotel recommendations - for which I use Routard anyway. Reliable on factual info about places we might like to visit, and that's all I ask. The Rough Guide to France. I will also be carrying Fodors, which I don't really rate (it appears to be aimed at people from midwest USA who have just sold their hardware store) but someone might find useful. The Seven Pillars of Wisdom by T.E Lawrence. Lawrence of Arabia's take on World War 1 and the Middle East crisis. Susan bought this for me in hardback about 15 years ago, and I have never quite got around to reading it. Herodotus - The Histories, Robin Waterfield (Translator). A brilliant translation of a book that proves that nothing changes.... I bought this when teaching in Korea and love it. I also carry Plutarch - Greek Lives and Thucydides History of the Peloponnesian War for the same reasons. White Fang and The Call of the Wild by Jack London. It's Jack London. There is no excuse necessary for reading this. 'Nuff said. I bought this in Hawaii 10 years ago and have just about worn it out. Monsieur Pamplemousse Omnibus Volume 3 by Michael Bond. Everyone knows Paddington Bear, but few people seem to have heard of M.Pamplemousse and his trusty hound Pomme-Frites, which is a pity. M.Pamplemousse is an ex-Paris policeman who now writes for a food guide (in between adventures, naturally). Funny stuff. I also have various handyman books in French and English, dictionaries, and Susan has a ginormous pile of bird, flower, tree and insect books as well. 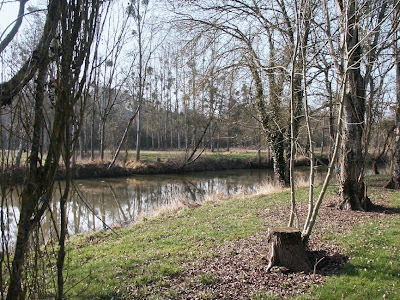 The first photo is looking upstream from our favorite spot on the river in Preuilly. This was taken on a very bright but quite fresh day in September 2007. The ripples on the river really play havoc with the reflections! The second photo is taken just upstream from Bossay-sur-Claise. I love the tree plantations along this part of the river. At a glance I think they are poplar, possibly black poplar. I think it is probably impossible to reproduce at home the brioche you can buy in the boulangerie-pâtisserie, but you can certainly produce something with more character than the supermarket version. Brioche these days is well-known for being the 'cake' Marie-Antoinette suggested the populace ate in the absence of bread (although some sources point out that as an Austrian, she may actually have referred to Kugelhopf). C'est la même farine - the issue is she was having a blonde day and they are leavened breads enriched with egg and fat to produce a treat, not everyday fare, unless you were rich. I used Andrew Whitley's recipe from Bread Matters. Like Hugh Fearnley-Whittingstall's Meat, this is part polemic, part recipe collection, aptly subtitled 'the state of modern breadmaking and a definitive guide to baking your own'. I can recommend it, although you may never be able to face supermarket bread again. The discussion and instructions for brioche covers six pages (the recipe proper takes up four of these). He begins by saying: 'Making brioche by hand is an experience: it's pleasantly energetic, and quite a challenge to incorporate so much butter into a seemingly unwilling dough. Eating it is the reward for trusting in a favourable result when all the evidence seems to suggest disaster. Doing it yourself means that you can avoid the strange compound fats that are used to eke out expensive dairy butter in [supermarket] brioche, not to mention the gratuitous additives that make it look good and 'keep' for an improbably long time. If you make it yourself, you can eat it genuinely fresh.' Incorporating the butter into the dough is done by squishing and stretching the mixture between the hands for about 15 minutes. It is not kneaded on the bench like an ordinary bread. It's a good idea to prove the dough overnight in the fridge. It makes it more manageable when shaping for the tin, and means you can produce it warm for breakfast. 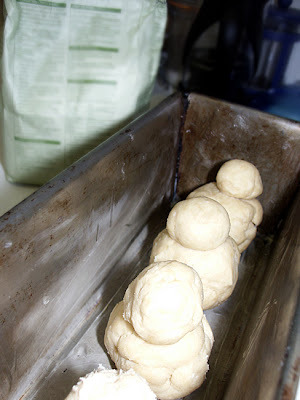 It is not necessary ( or worth it for home baking) to put the dough in a special brioche mould. Here I have made four mounds which will merge together somewhat once proved and cooked. Simon was worried that the tin was not very photogenic, but my feeling is that it is an honest, good quality, well-used tin. The end result looks and tastes rather like fruitless, spiceless Chelsea buns (but better than that sounds). 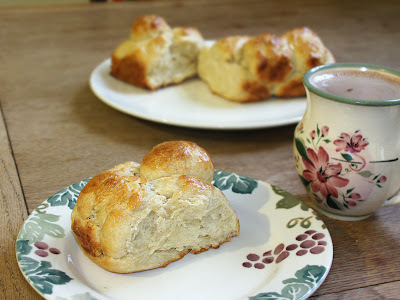 This brioche is not sweet, but ideal for tearing up and dipping into chocolat chaud* before eating. *The hot chocolate is in a mug made by my Australian potter friends Ricky, Elise and Gillian. Our car insurance runs out at the end of June. When we first bought the car we bought our insurance over the internet because we were in England and needed French insurance. This seriously limited any opportunity we had to hunt around for a good rate. 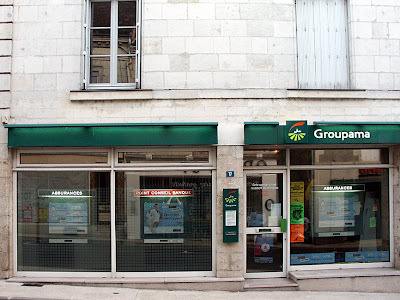 This year because we are going to be in France when the insurance comes due we can visit some insurance companies and hopefully pay less in future. 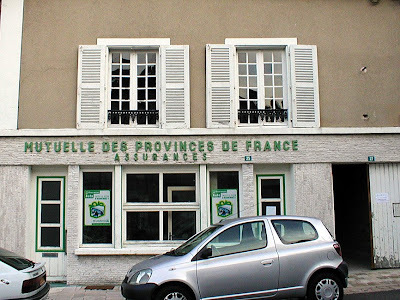 Insurance is big business in France - Preuilly has 3 agencies for its 1,400 (or 1,100, or even 900 according to which figure you believe) population. In addition our bank will quote on insurance. It isn't like we will be short on choice. After hairdressers, they are probably the most common shops in a French village. However............. cancelling insurance in France isn't just a case of not paying the old insurer. To not renew your insurance you need to advise the previous company 2 months in advance of the expiry date by registered post. To send a letter registered post means being in France - which I am not. This means my carefully laid travel plans now have to be amended so I can be in France in time to see some insurance agents, and send off a letter in time to be received before the end of June. I have emailed various agents, but this being France - where emails aren't taken as being very grown up - I don't expect an answer. Not that I mind being in France a week longer, just that everything I was leaving til next week has to be done yesterday or sooner. 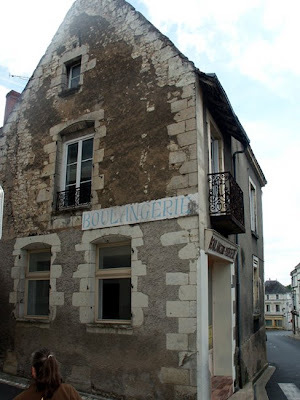 One of the properties we visited when we were looking for a house was the old boulangerie in Preuilly, which is opposite the Maison Renaissance. We loved the 11th century cellar and small section of colombage (half-timbered) balcony, but the lack of garden was a problem. As was the one semi-underground room of 110m² - we had no idea how we would use such a space. 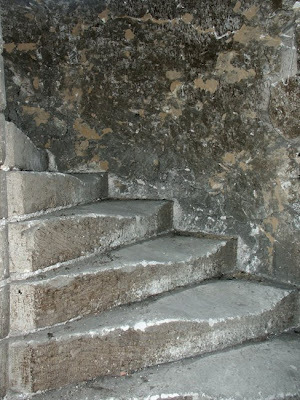 Another problem was the communal staircase. The house has no stairs of it's own, but shares a very worn spiral stone staircase with the semi-derilect building next door. The stones were so worn that they would requre boxing in using wood. The photo really doesn't do the stairs justice - we are sure theys were more worn than this, so maybe I just couldn't get the most worn stairs into a sensible photo. It's a lovely day in London today, so we're off for a walk. This involves getting in the car and driving to somewhere we want to walk. If we didn't drive it we would be exhausted by the time we got somewhere scenic. 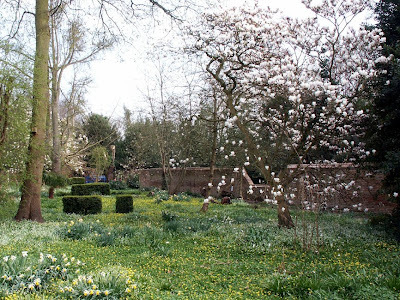 As it is, a 10 minute drive and we will be in Miss Ellen Willmott's garden at Great Warley. When we are in France (at least for the first year or so, anyway) we won't have to drive somewhere to walk - we will close enough to the countryside for it to be a complete walking experience. All we need now, though, is for someone to realise what a bargain my house in Australia would be. 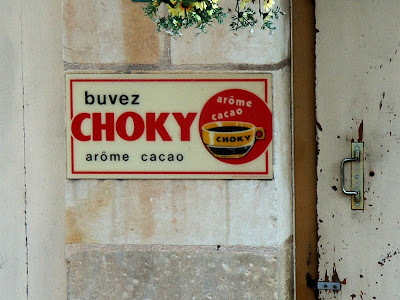 We know about Banania (which supposedly is banana tinged, but really isn't in any tastable way) and Poulain (which is choix de la maison), but until visiting Bossay sur Claise we had never heard of Chocky. I don't think you can get Chocky now, as a quick quick check of the internet shows no sign of it. 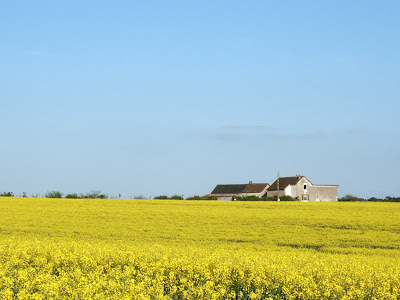 Here in the Touraine we are part of that great band of lard that stretches across the middle of temperate Europe. Here the pig is king and local delicacies tend to feature lard and include cured meats of great inventiveness and variety (charcuterie). To the south the olive dominates the landscape and the cuisine. But north of us, la vache (the dairy cow) is queen and butter the favoured culinary fat. Kouign Amann (Butter Cake in Breton) is designed to use a substantial lump of butter to transform a simple flour, water and sugar concoction into something irresitably caramelly. It's all in the folding and layering and the subtle, sparing application of sea salt crystals, another Bretagne speciality. There's been a bit of discussion on Clothilde's blog Chocolate and Zucchini about this rustic pastry disc. It is quite tricky to produce an authentic result, especially outside of Bretagne, but I decided to give it a go. I used David Lebovitz's recipe from Living the Sweet Life in Paris. Being in London at the time, I used Tesco own-brand organic plain flour and Tesco Finest Brittany Butter with Sea Salt Crystals. The dough behaved very well, was easy to work and did not go sticky (except where one was rolling pure butter of course). All was looking good, but I made a fatal error in my choice of pan. I used an 8" pan with vertical sides of about 1½" and a removable base. After 20 minutes in the oven it was obvious that a lot of butter and melted sugar had leaked out and was burning on the bottom of the oven. I had to stop the whole thing, turn off the oven and remove the pastry. See the result above - a bit pale and wan looking, but some caramelisation happening. Nevertheless, it was just about edible - a bit doughy, but I can see that if I seal the pan with silica baking paper or something and repeat the recipe, it will work out fine - somewhere between cake, bread and pastry, with lots of caramelised sugar both gooey and crunchy. All my round pans have removable bases, but I'm guessing that if I try it in a solid square pan the corners will burn. I didn't find it particularly difficult, but mine is missing is the crunchy toffee base because half my toffee forming ingredients ended up on the bottom of the oven. 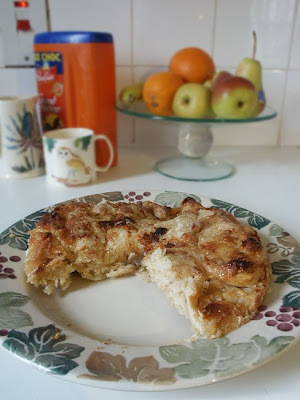 Next time I am thinking of slipping slices of apple in with the butter, but then of course, it won't be Kouign Amann. Susan and I have finally made it into Chatellerault. The town proper, I mean, not just the ring road, the station or the supermarché/bricomarché on the outskirts. 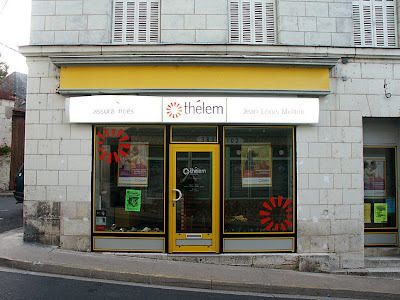 Not that we spent much time there: we had a misunderstanding with France Telecom to sort out. This took slightly less time than we had available on our parking ticket, so we took a quick turn through the marketplace. Next step will be to spend an hour or two actually walking around the shopping streets, finding out what delights it may have in store for us. It certainly looks appealing enough - a hint of narrow alleys with old shops and cafes. This chic creature with its carapace like black japan could easily be mistaken for a parasitic wasp, but it is in fact the snail killing fly Sepedon sphegea (Sciomyzidae), or in French Sépédon sphex. They are relatively large and can be easy to spot if you are down amongst the Yellow Iris Iris pseudacorus at the waters' edge by a pond or river. My French field guide describes them as 'espèce svelte, toute noire, aux pattes rouge jaunâtre', 8-11mm long and flying from April to October. 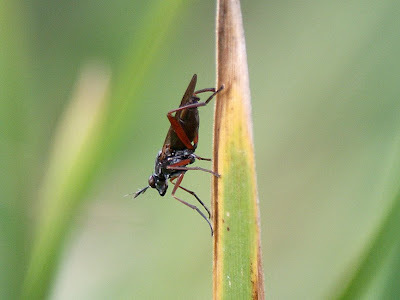 This picture, taken at Chaumussay, shows the fly in a typical pose, head down on an iris blade. If you get too close, it will sidle around to the other side of the leaf in preference to flying, rather in the manner of a damselfly keeping out of sight. of fresh snail flesh for breakfast lunch and tea. as well as mates to share their repartee. and die untouched by winter’s bitter days. By Gordon Ramel, 2008, and more of his poetry can be seen at Some Poetry from a Blue Magpie. 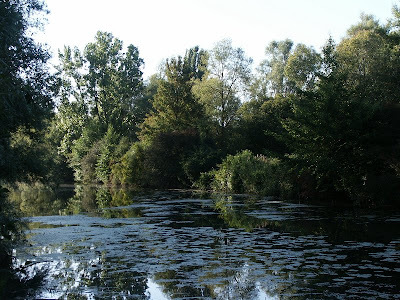 Gordon is currently running a biodiversity study at the fabulous Lake Kerkini Wetland Project in Greece and is the author of the rather wonderful Earthlife.net website. 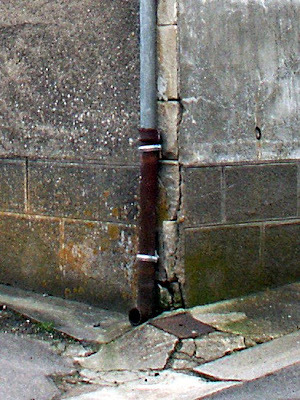 This wouldn't be bad, but maybe a bit grand compared to the previous well. The oldest chateau in Preuilly and once seat of the Barons of Preuilly, the Chateau du Lion has a long and chequered history. 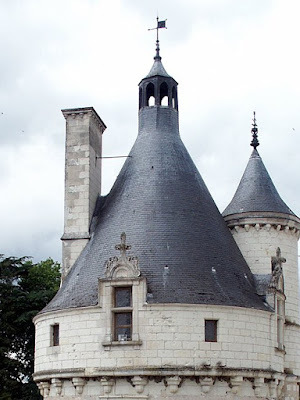 The first castle on the site was built by the first known Baron of Preuilly - Atton - in the 9th century. Nothing of this structure remains, as in keeping with most defensive works of the time it was a mound of earth topped with wooden walls. 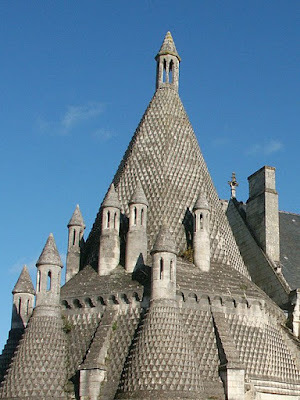 During the 10th and 11th centuries the castle was reinforced with masonry, but then was destroyed by Foulques of Anjou (presumably Fulks III). 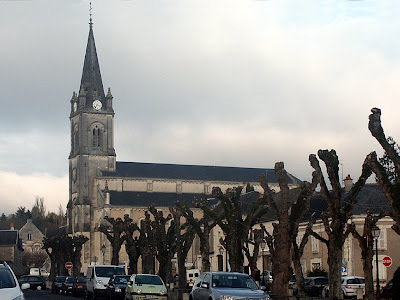 Preuilly is in an area that during the 100 Year Warwas on the borders of English and French territories. Work was done by the English on the castle to make it a secure base for carrying out incursions into the the French territories. 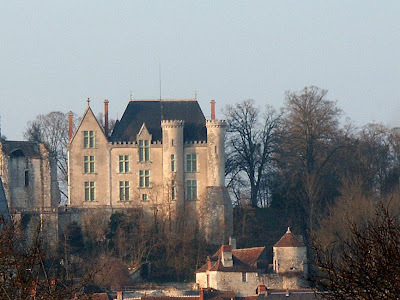 In 1369 Bertrand du Guesclin and Jean de Bueil (Jean III) ended the English occupation and returned the castle to its previous owner Eschivart VI, Baron of Preuilly. In 1422, the work of enlarging the fortification and repairing the damage done during the 100 Years War started. 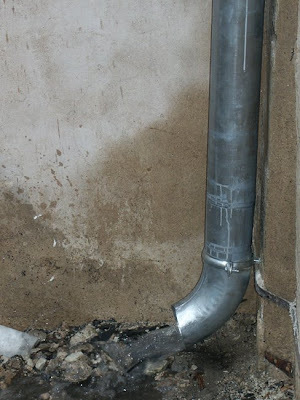 This work was extremely expensive but was made more economical by taking materials from houses owned by the abbey. By 1535 the castle was described as having "80 rooms with chimneys and more, and rooms and kitchens, barns, cattle sheds and various entries." 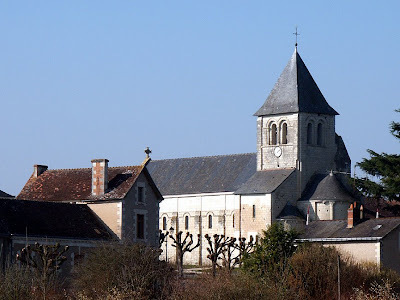 In 1562, (the wars of religion) the Protestant owned castle fell to Chesne-Brulé, governor of Angles (sur-Anglin). 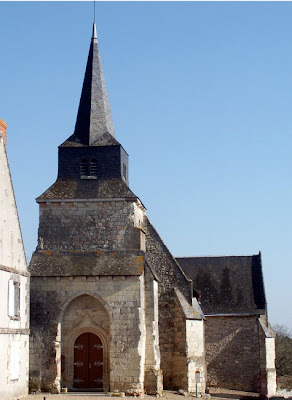 Serious damage was done, most obviously to the chapel Ste Mélaine.By 1761, the castle was in poor repair, and in 1769 was rented to a peasant to be used as barn. In 1803, Michel de Young bought the lands of the Barony of Preuilly and undertook to sell the stones and beams and by the beginning of the 19th century, the castle was nothing more than a building material warehouse. In 1816, the mayor Mr. Delatramblais decided to allow the ditches of the northern side to be filled to allow the building of a new road to Tours. At the beginning of the 20th century (in 1905-1906) the castle, by then property of the Cartier family, was rebuilt (in a style described by the Preuilly Archeological Society as "at the very least debatable") but at least it stopped the destruction of what remained. The Chateau is now a private home, and is not open to the public. The Postern (gate house) is now the Preuilly museum, having been donated to the town in 1966 by the Carter Family. PS It's snowing properly today in London. For some reason it seems apt, considering the controversy about the Olympic Flame, which is also in London today. 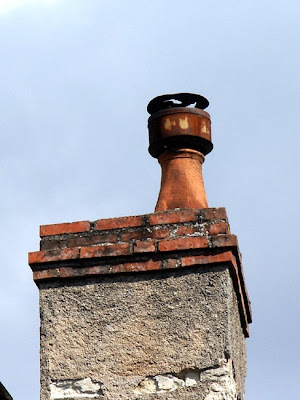 The Flame goes to Paris tomorrow, which some consider to be rubbing salt in the wound. No, don't get excited - he's not coming to Preuilly (at least, not as far as I know), but he has just had London scrutinising his every move, so I thought I would offer my 2 cents worth. Of course, even with my limited visual exposure to the Presidential entourage, I was struck by how charming and elegant Carla is (and how much taller than her husband she is) and how stylish and attractive Rachida* and Rama* are. But I wasn't so dazzled as to not take in some of the things M. Sarkozy actually said. For instance, I noticed that he began the answer to every question put to him with 'Ecoutez' or 'D'abord' or even 'Ecoutez d'abord'. The translator, the skilled professional you would expect, did not begin each of his sentences with 'Listen up', but cleverly rang in the changes with 'Well', 'In my opinion' and 'It seems to me', knowing that 'écoutez' has a different nuance to 'listen' as an opening gambit. I also hope that the English were listening when he addressed Parliament and said that the French will never forget what the British did for France during the two World Wars. Having lived for ten years in East London and Essex, I am saddened (and increasingly exasperated) when I hear the old 'the French just rolled over and allowed the Germans to walk in' routine for the umpteenth time, usually from someone too young to have been there at the time. I am saddened, because although I am aware that the War and the Blitz in particular was an awful and terrifying time to go through, there often seems to be no empathy from ordinary English people for the experiences of ordinary French people, living as they did with enemy troops on their land, in their villages and in their houses. They too saw friends and relatives killed and maimed in unspeakable ways, and very often they could not even speak out about it. Simon made the point to me that Nicolas Sarkozy is part of the first generation of politicians in France not to have been directly influenced by de Gaulle. Sarkozy clearly wants to change things and that's why people voted for him. It remains to be seen what happens when he actually tries to change something - all those people who voted for him will suddenly find their conservative streak, I'll wager (note the small "c" - in France the conservative position is socialist). PS I read recently that English is the result of a Saxon warrior chatting up a Celtic barmaid - I'm paraphrasing somewhat, but it's good, innit? *Rachida Dati, the Justice Minister and Rama Yade, the Junior Minister for Foreign Affairs and Human Rights. I developed this recipe after I bought some walnut oil from a local small scale producer at the market in Preuilly. The oil was bottled in recycled plastic water bottles, and turned out to be so strongly flavoured that it completely overpowered any salad it dressed. But it had not been cheap, and I didn't want to leave it to go rancid. So, what to do with it? 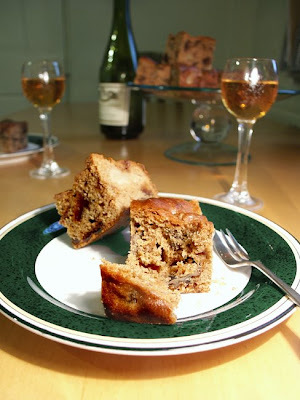 Then a neighbour gave me a bag of walnuts and I thought I would experiment with a walnut cake. This is a recipe for autumn abundance and I included pears because they often need using quickly in season. I first roasted the walnuts in their shells in the oven at 180°C for about 10 minutes. Once they were cool enough to handle, I extracted the nuts by holding the stalk end of the shell down on the wooden chopping board and giving the pointy end a sharp tap with the meat tenderiser. 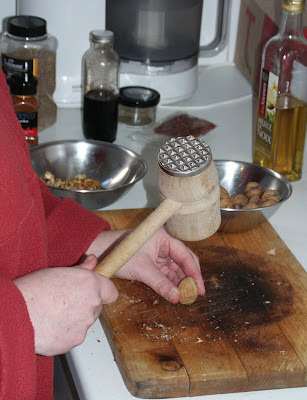 This usually splits the shell neatly in half and allows you to extract the nut either entire or as two nice halves. Don't do this on a prized or expensive board, as it does damage the board (and the meat mallet if it is wooden). Once the nuts are out of the shell you have to pick out the woody membrane that will be entangled within the nobbly lobes. The recipe makes a rather dense cake which keeps well and is actually better on the day after baking. Very easy, and quick to prepare except for the nuts (and you can 'cheat' by buying ready prepared nuts – buy walnut pieces rather than halves, as they will be cheaper and make no difference to the cake). 1. Preheat the oven to 180°C. Line a 30cm square cake tin with silica baking paper. 2. Beat the oil and sugar until thoroughly combined, then beat in the eggs. 3. Mix in the spice and flour, then the pears, sultanas and nuts. 4. Pour the mixture into the prepared tin and bake for 55 minutes. 5. Cool the cake in the tin on a wire rack. 6. Turn the cake out onto a board when cold and cut into 25 squares. At first glance, this structure at Confluent near Yzeures-sur-Creuse appears to be an over ambitious piece of decorative metalwork. 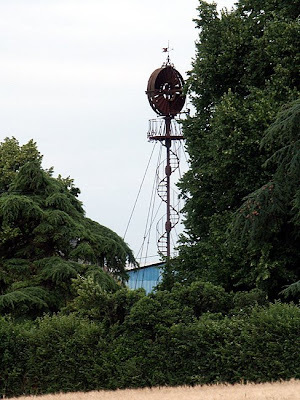 For some reason, the word "windmill" seems far too pedestrian: the French is "éolienne".There is a similar éolienne which is a bit of a tourist attraction at Dolus-le-Sec. Compare this to the much more utilitarian Australian version, manufactured in the Queensland town of Toowoomba. These windmills are not for milling - they are wind powered water pumps, used in Australia for lifting water from the artesian basin. I assume they are used for similar purposes in France, as Dolus-le-Sec translates as "Dolus the dry". In the little aboretum attached to la chapelle de tous les saints in Preuilly there are two Cedars, planted so close that their trunks almost touch. They are clearly different in appearance, but are they different species? True Cedars (Cedrus spp) are complicated taxonomically, and difficult to identify with any confidence by amateurs. Even botanists are still arguing about whether there are two species or four, and there are several varieties of the most famous species, the majestic and romantic Cedar of Lebanon. 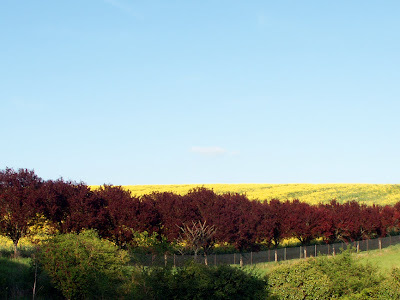 The website for the trees of note in Indre et Loire lists these two as Cèdre de l'Atlas C atlantica and Cèdre du Liban C libani - but which is which? And why are they planted so close together? Goodness only knows what the gardener was thinking at the time - surely they must have realised that as Cedrus, whatever species, the seedlings they settled into their new home were destined to be enormous trees? Cedar of Lebanon is native to Turkey, Syria and Lebanon. It is often seen as a park tree in Europe. They grow up to 40m and are conical when young, only developing the characteristic massive trunks and heavy horizontal branches with flat 'shelves' of foliage with age. The most famous Cedar forest in their native Lebanon is the Arz ar Rab, a group of 300 or so miraculous survivors - some 1500 years old. It is a World Heritage site. A cedar features on the Lebanese flag and they are spoken of in the Bible, travellers' accounts and Arabic and European poetry throughout the ages, acting as powerful symbols of strength and constancy in a beleagered land for centuries. A beautiful mature Cedar of Lebanon in a farmyard near Yzeures sur Creuse The first Cedars of Lebanon are said to have been brought to France with Louis VII (Eleanor of Acquitaine's first husband) when he returned from the Second Crusade. 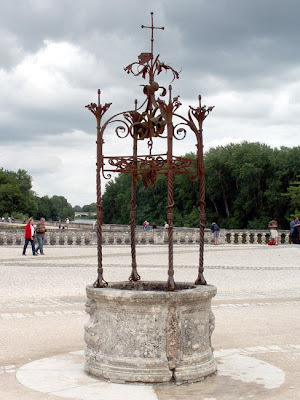 He had them planted on the hillside overlooking Vitry-sur-Marne in Champagne, as part of his penitence for the burning alive in the church of 1300 citizens of the town in the course of a disagreement with Count Theobald (the Great) of Blois and Champagne. The descendents of these seedlings grow there to this day. 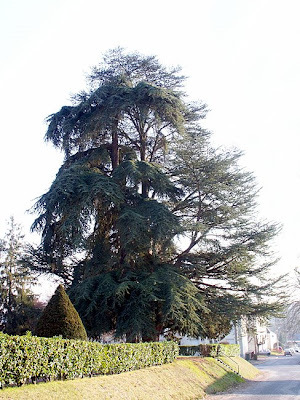 I think the biggest Cedar of Lebanon I have seen is in the courtyard of the Musée des Beaux Arts in Tours. If you come in off the street and stand in the gateway, the tree gives the appearance of being as wide as it is high, and its lower branches are all supported on sturdy crutches. It takes up almost the entire courtyard. The pictures on the 'Trees of Note' website don't convey its sheer massiveness, but there is an interesting newspaper clipping included (in French). The species has a reputation for losing branches in strong winds and several prominent families have their version of the legend that predicts a death whenever a branch falls from the Cedar on their front lawn. 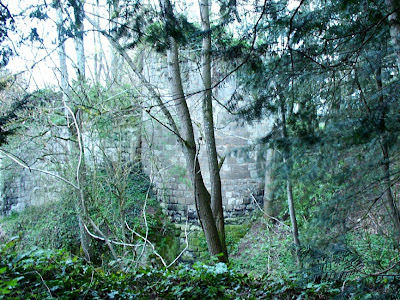 Curiously, Cedars of Lebanon didn't appear in Britain until the 17th century. The Atlas Cedar, granted full species status by many, but still considered to be a variety of C libani by others, is native to the upper slopes of the Atlas and Rif Mountains in North Africa (Algeria and Morocco). It is surprisingly tolerant of chalky soils, probably because it likes to be extremely well drained, and is normally grown from seed. The whole plant is aromatic and it also tolerates atmospheric pollution. This cedar did not appear in Europe until the mid-19th century. 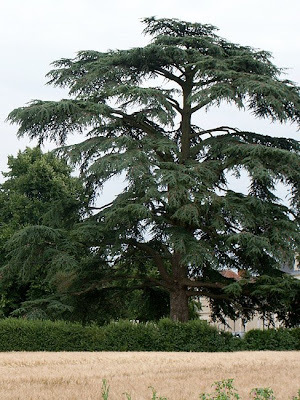 To see another Cedar species, go to our blogger 'neighbour' Ken at Living the Life in Saint-Aignan. His mystery tree has finally be identified by Dr Dawn Edwards of the Royal Horticultural Society as Cedrus deodarus Deodar or Himalayan Cedar. Turns out he's also got an Atlas Cedar too, which also took a while to put a name to. PS The Cedar of Lebanon in the Preuilly arboretum is the darkly drooping tree at the front and the Atlas Cedar is the more glaucous and airy tree behind.